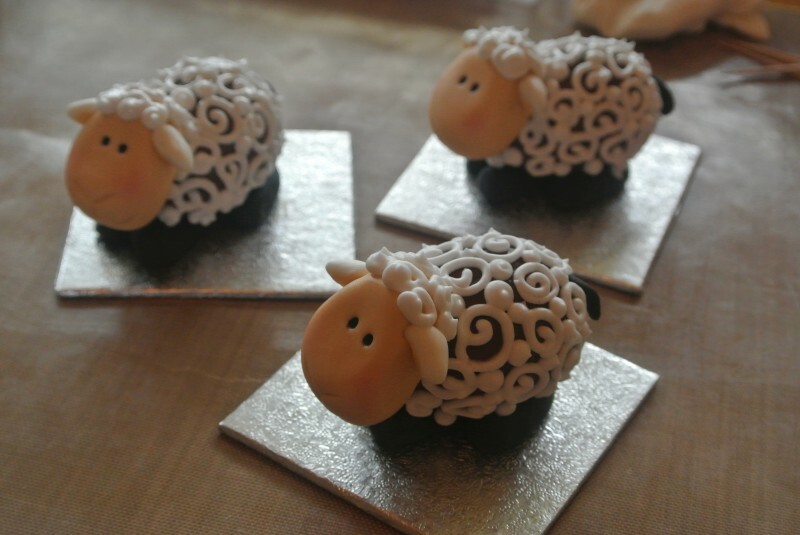 I’m setting my little lambs on mini cake cards, depending on what you want to do with them after you’ve made them they can be made on a plate, a small piece of card covered in foil or a small square of baking paper. Just make sure you’re making them on something that you can easily move around. 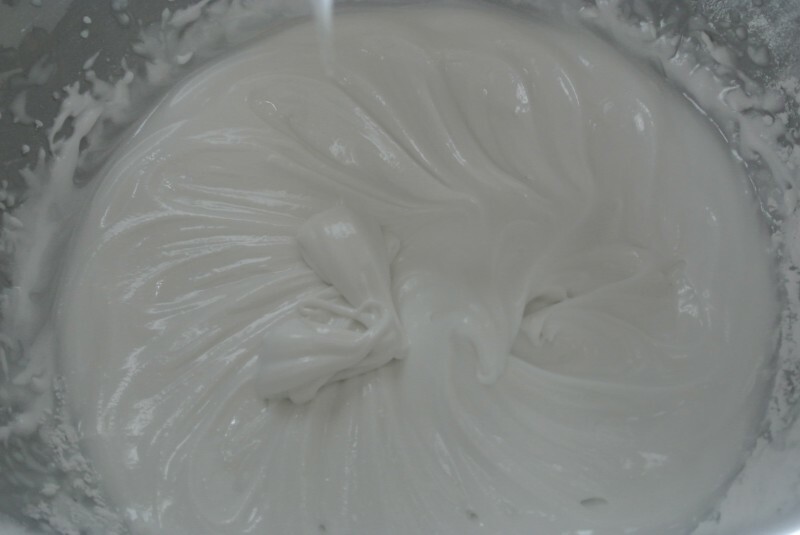 Greasing your hands with a little bit of Trex (white vegetable fat) will stop the sugarpaste from sticking to you whilst you’re working and give the sugarpaste a nice shine, not too much though or it will end up super shiny! 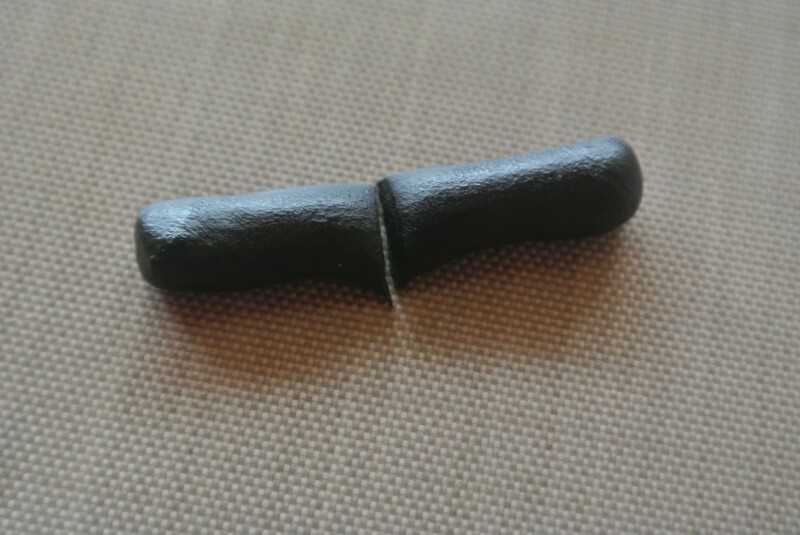 Roll a sausage of black sugarpaste, flatten the two ends and cut it in half. Position on the covered card as front legs. Roll another sausage, slightly longer and fatter and do the same for the back legs. 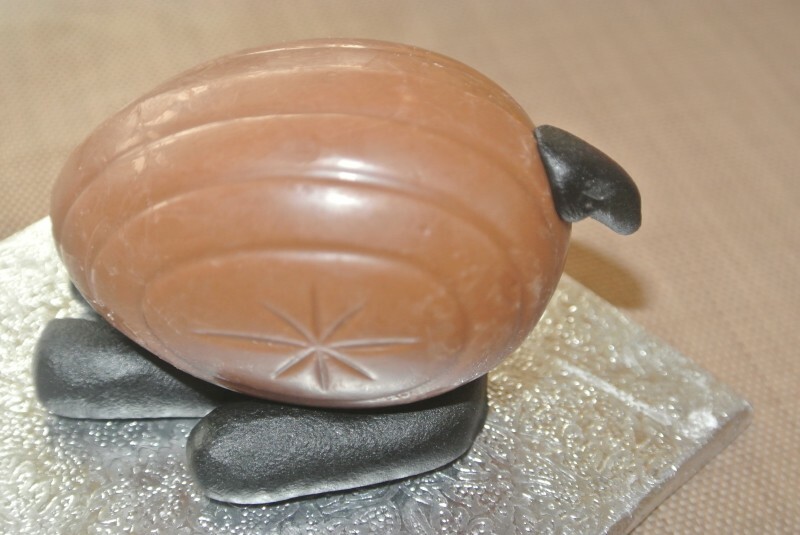 Now unwrap the chocolate egg and press it onto the legs. 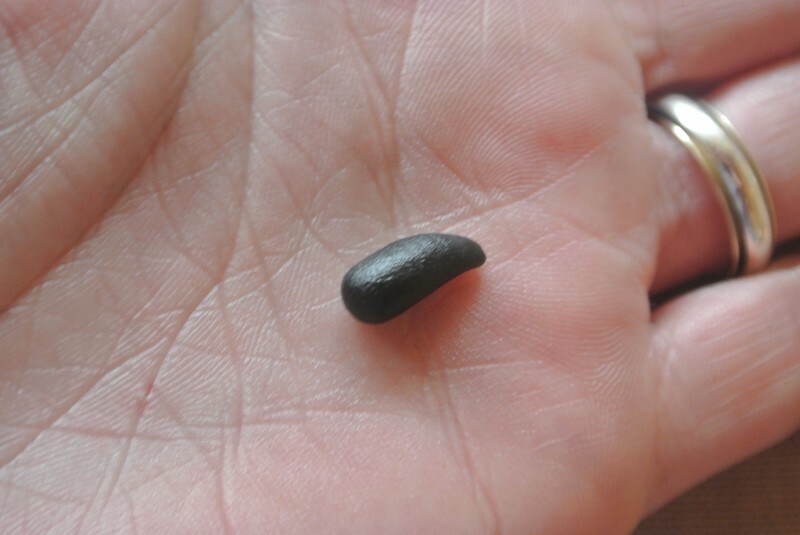 Roll a small amount of black to shape a tail. Press it into position. 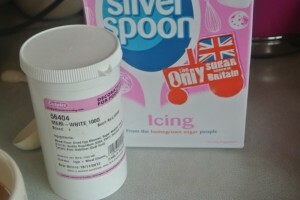 The sugarpaste should stick easily without the need for any sugar glue or water. 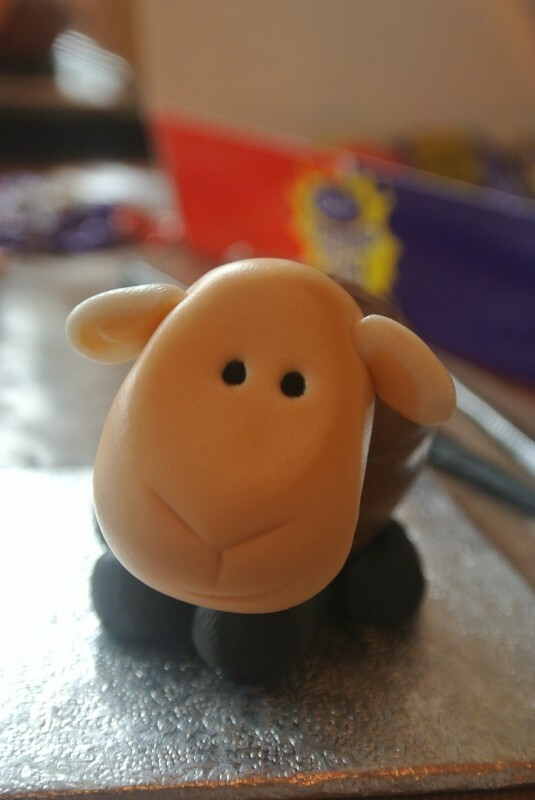 Wash your hands really well before shaping the head, the black colouring is easily transferred to your hands and will make Mr Lamb look like he has a dirty face! Roll a ball of peachy/flesh/pink sugarpaste. I coloured my own using the ivory from the Wilton set. Once it’s in a neat ball, roll your forefinger across the middle of the ball. 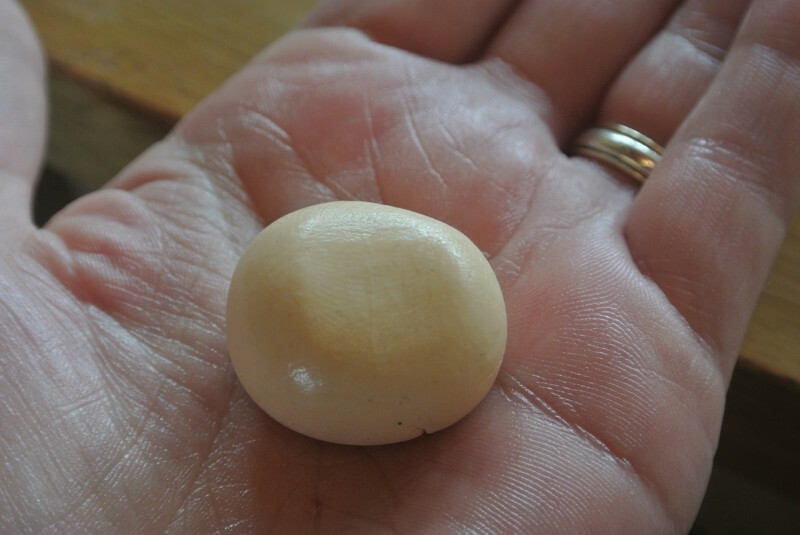 It will flatten it in the middle and form this shape. Squidge the thinner flatter end slightly with your fingers – this part is the top of the head and should be narrower than the mouth part. Now press the head gently into position. 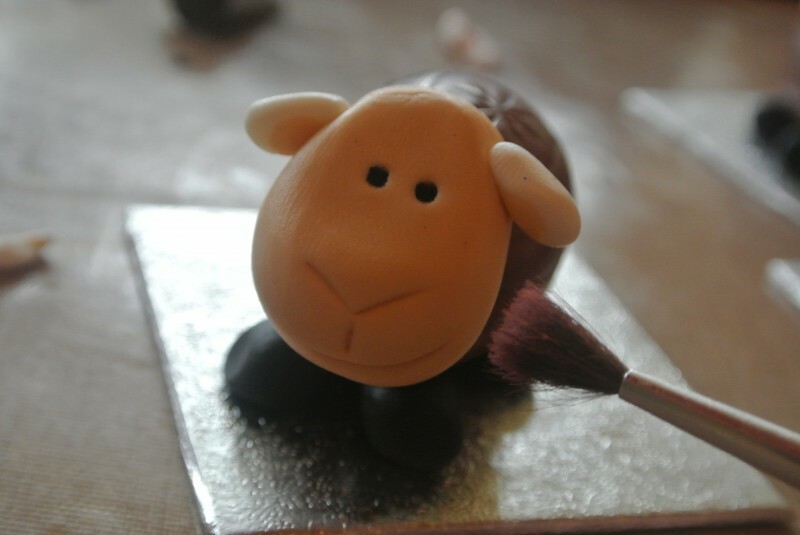 Using the wrong end of a paintbrush poke a hole on either side of Lamb’s head where the ears will go. 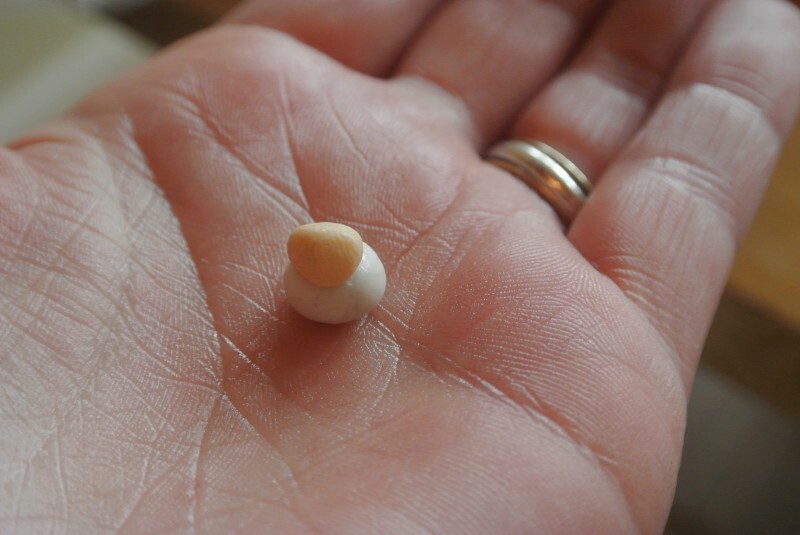 Roll a small ball of white sugarpaste and an even smaller ball of flesh. Set them on top of each other ball and press them gently together. Taper the end of the ear to a thin point. 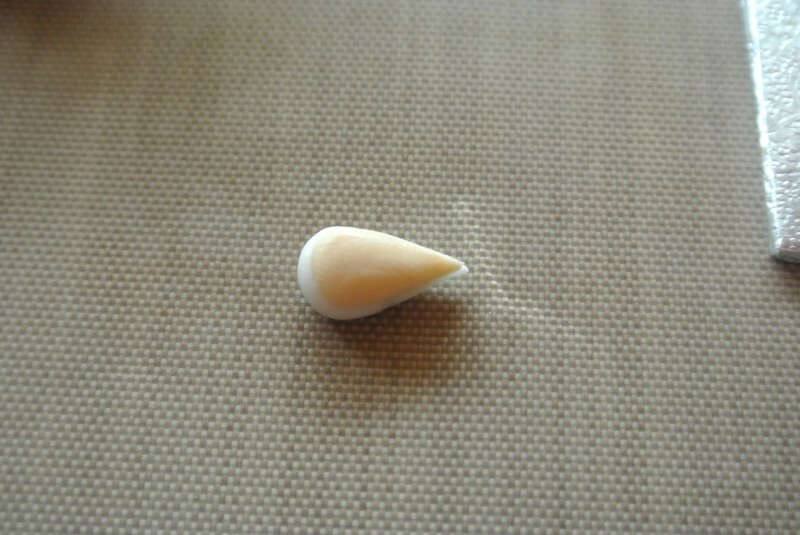 The thin end gets posted into the little hole you made earlier and the ears droop downwards with the white part uppermost. Press lightly into the hole and to the head to secure in place. 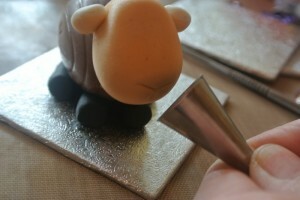 Now using a knife imprint Lamb’s nose in a v-shape with a line going downwards. Add an imprint of a smile with the wrong end of a piping tip. Two dots with the black icing pen make the eyes. And a dust of pink lustre dust for rosy cheeks. Now for the royal icing. 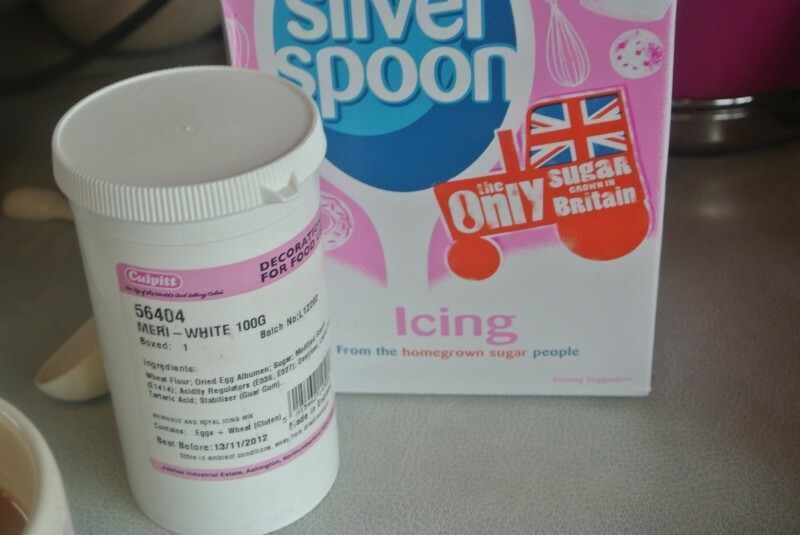 I prefer to make my own mix using regular icing sugar and meri-white (a powdered egg white) – 450g icing sugar, 1 tbsp meri-white and between 60-90ml water added gradually. Whisk to combine…and then it’s really important to continue whisking until the royal icing thickens and forms soft peaks. 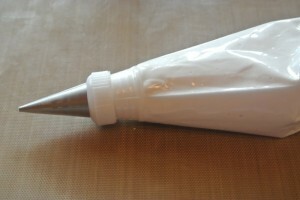 Into a disposable piping bag fitted with a no. 2 piping nozzle. 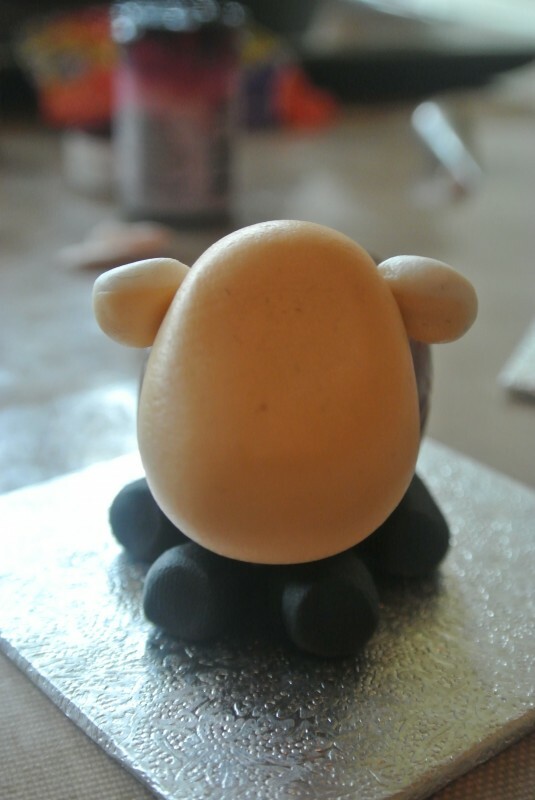 Pipe on small blobs of royal icing across Lamb’s forehead. 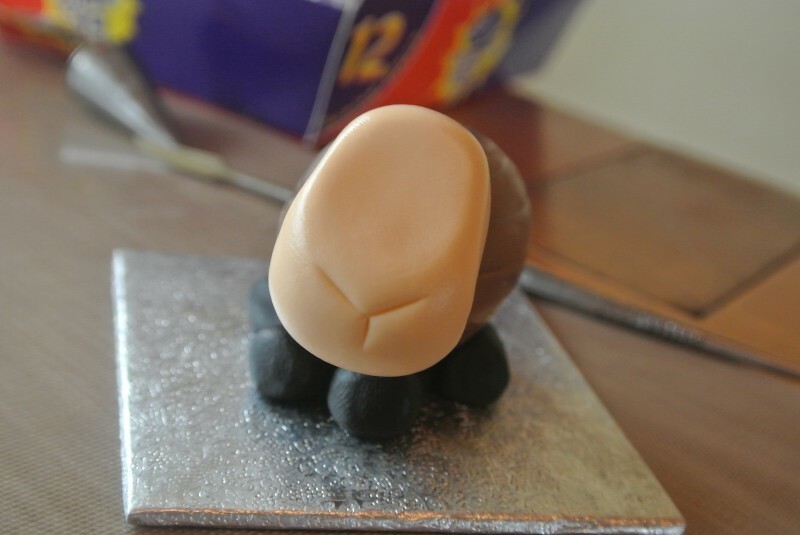 Fill the back of the head with icing blobs right down to the chocolate egg. 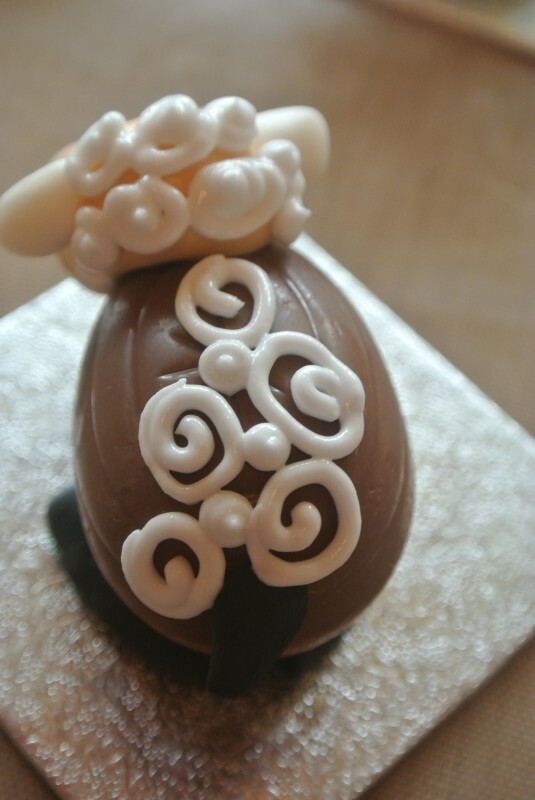 Pipe swirls all over the chocolate egg. 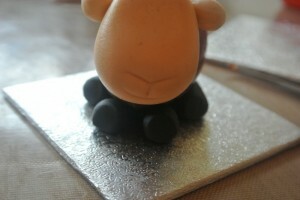 Don’t worry about the gaps, fill them in with small dots of icing. 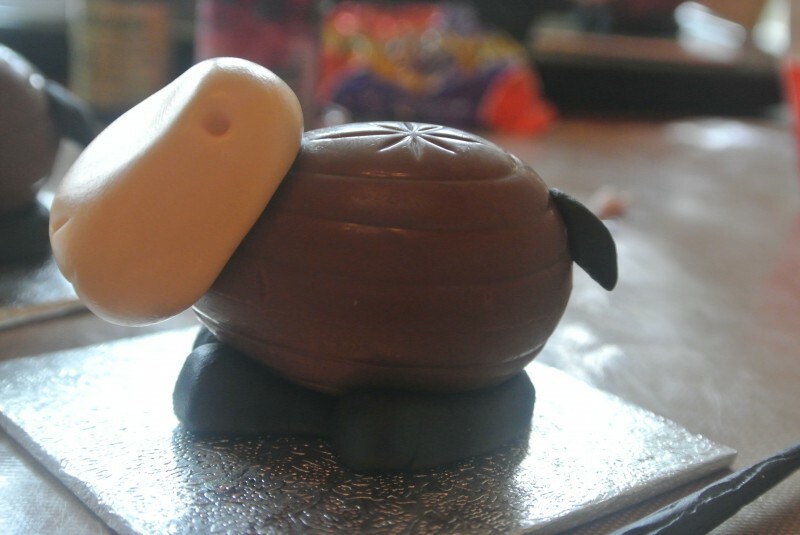 It’s easier to prop up the lamb to do the underside of the chocolate egg, simply use a ball of sugarpaste. 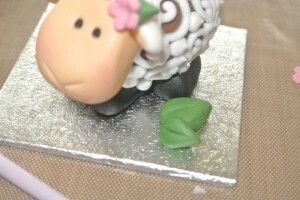 Cut out a small pink blossom and shape a little leaf from green sugarpaste and secure onto the lamb’s head using a dot of royal icing. Shape two more leaves for by the side of the lamb – simply roll a ball of sugarpaste, flatten with your fingertip and pinch one end to a point, mark a central vein down the middle using a knife. Stick them by the side of the Lamb with a dot more royal icing. 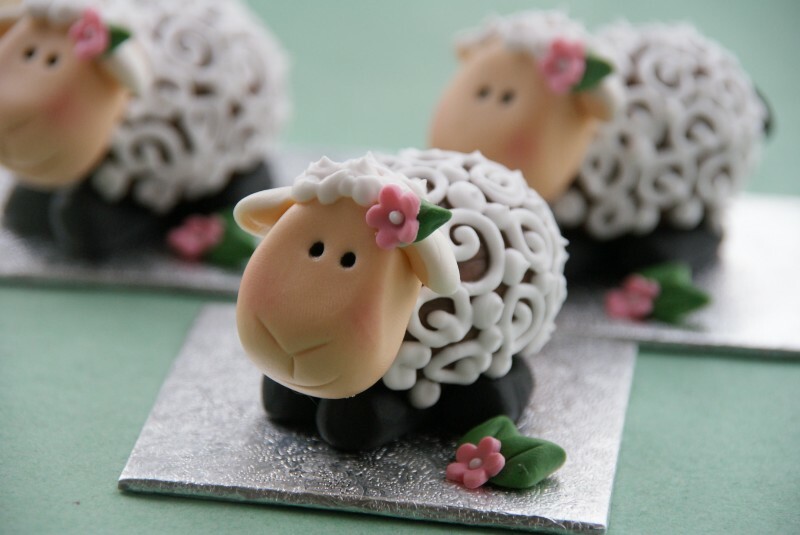 Add a blossom to the leaves on the board and fill the centre of each flower with a small dot of royal icing. 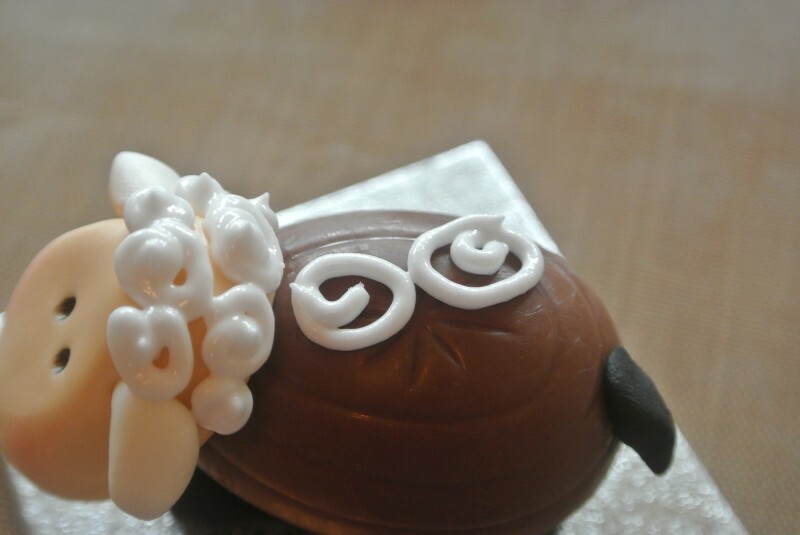 Easter Chicks are here if you fancy giving them a go too. This entry was posted in Children, Decorating, Easter, Gifts, Kids, Sugarpaste, Treats. Bookmark the permalink. 58 Responses to Easter Lambs – Creme Egg Animals! 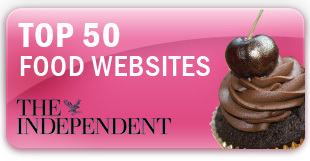 You’ve surpassed yourself here – they are absolutely adorable. 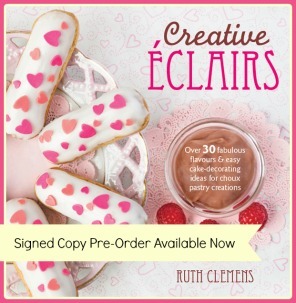 omg ruth, these are totally amazing! These are so cute! 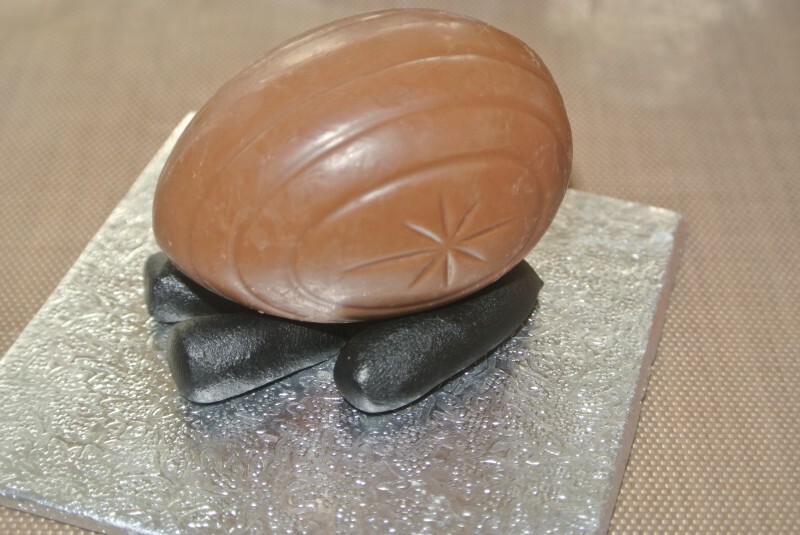 I wish I liked creme eggs though, I guess I could do it with another type of chocolate egg. These are so cute! 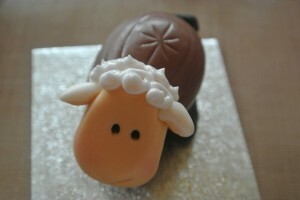 I’ll definately be making some for easter gifts. Lol these are beautiful,so cute. So pretty i wouldn’t even be able to eat it!! 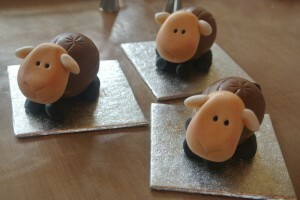 These are so lovely I wouldn’t let anyone eat them! OMG!! These are sooo cute. I love the rosy cheeks. They make such a difference. 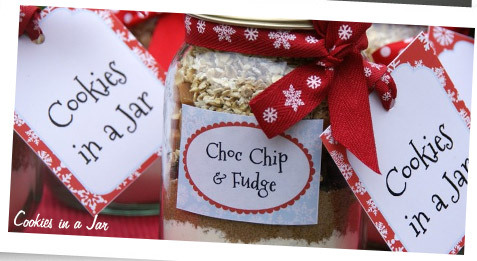 These are so cute – such a clever idea! 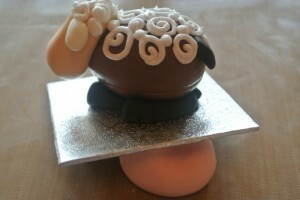 This is quite simply why you should have won the bake off in my eyes! 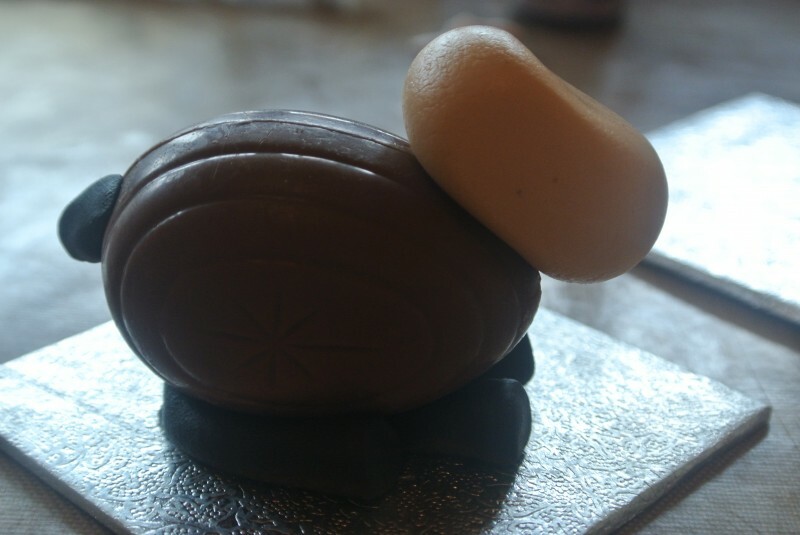 Is it just me or are creme eggs these days decidedly smaller than they used to be? Oh my…these are absolutely awesome! You are so creative! Love these…thank you for sharing with us! These are sooo adorable!! Such a clever idea! Is sugarpaste and fondant the same thing? Can you make your own sugarpaste or is it something that has to be purchased? Could you please tell me where I might find it? 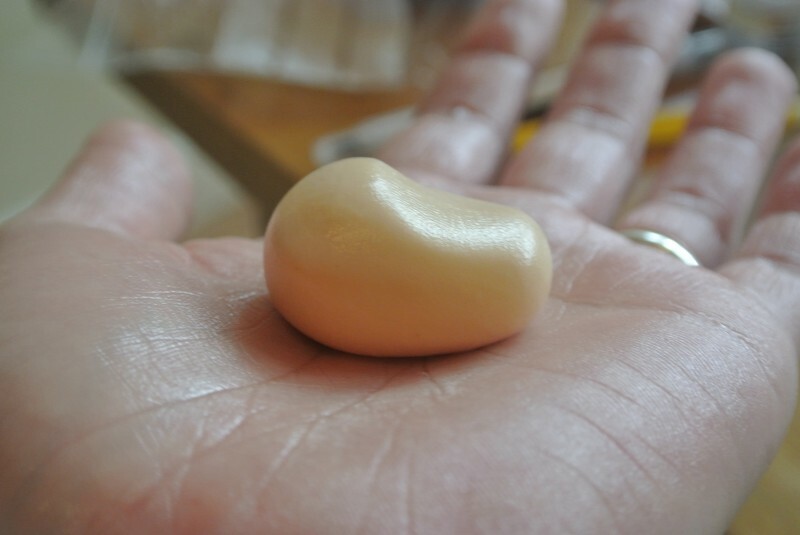 I’ve heard of gumpaste, marzipan, and fondant, but not sugarpaste…. Thank you. These are so adorable – thank you so much for sharing! How long can one keep treats iced with royal icing? 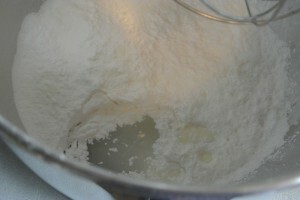 I’m always nervous of raw egg when working with kids (I teach) but I’ve never thought to use powdered egg white (doh!). Is it safer? Assuming the treats aren’t eaten in one go, that is. 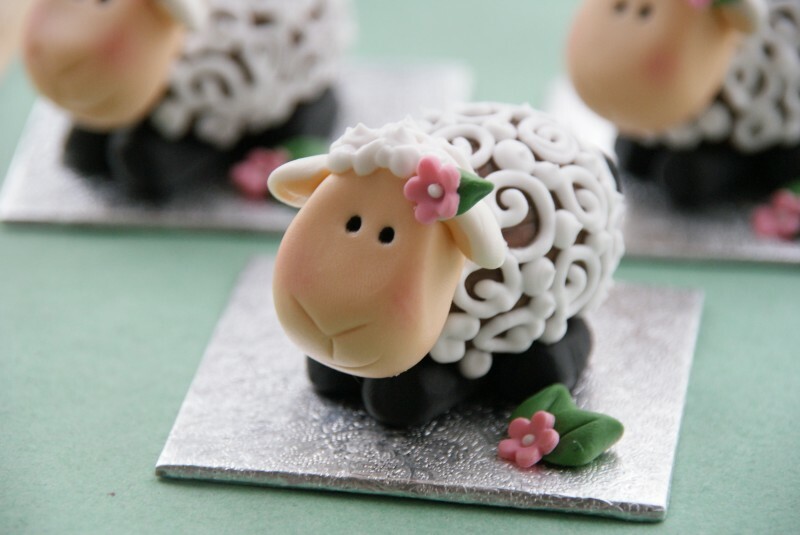 OMG…soooooo cute…Easter’s a week away…can I manage to get these done in time….maybe…going to give it a good try! Thamks for posting. These are absolutely adorable! 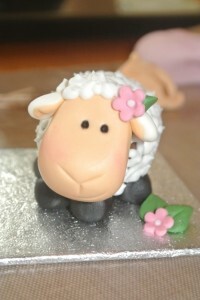 Can’t wait to attempt making them – I’ll be happy if they turn out half as cute as yours! They are amazing! 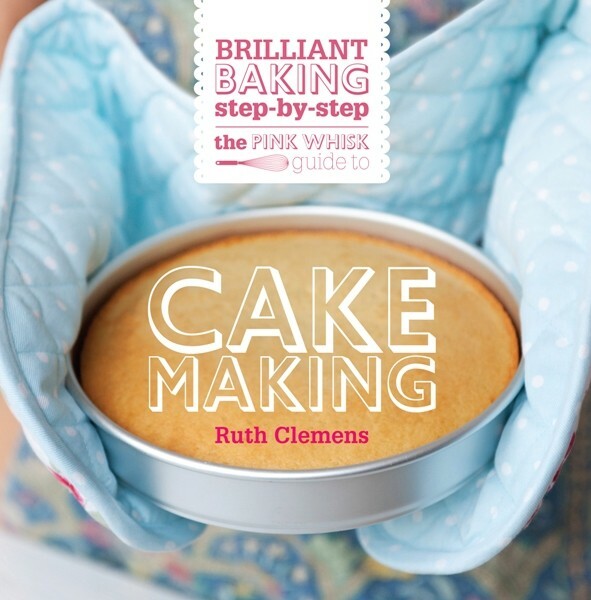 Thanks for the tutorial – you make it look easy! 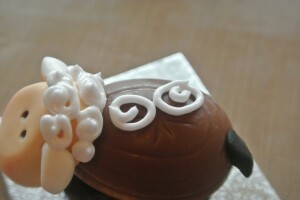 It’s a shame creme eggs are such vile things although another type could no doubt be used instead. I’ve just made my own lamb and it doesn’t look too unlike your pictures. I’m delighted because I’m normally completely cack-handed when it comes to anything like this. It’s all down to your really clear instructions Ruth. Thank you so much. I don’t have any trex,would a tiny amount of veg oil be ok as a substitute? Here’s my sample. 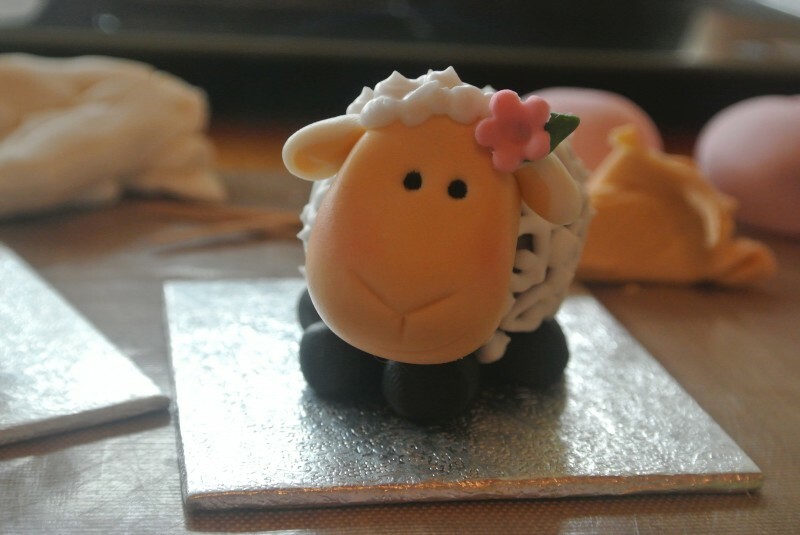 I don’t like the taste of fondant, so I used regular and flavored tootsie rolls for all the body parts and canned frosting for the “wool”. Didn’t have luster dust, so used pink cake icing in clear vanilla extract to paint the pink accents on the face. 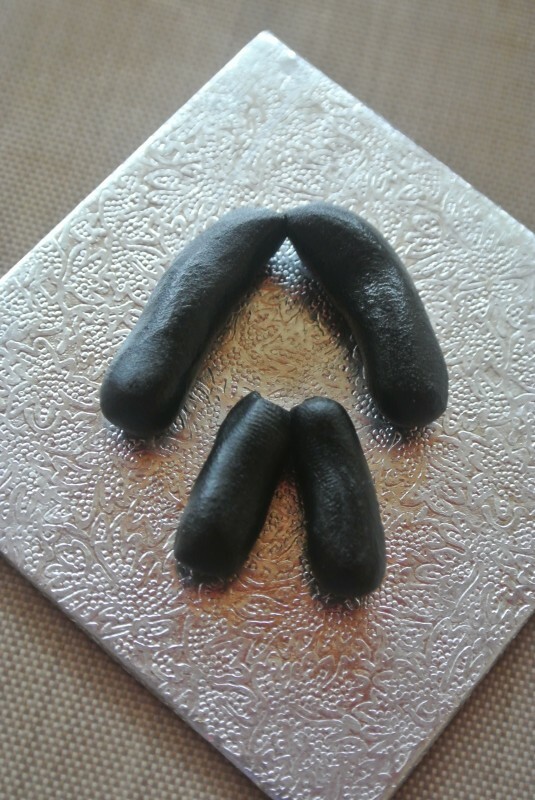 I used a toothpick dipped in black icing for the eyes. I used melted chocolate to attach all the pieces, just because that’s what I had on hand and who doesn’t like more chocolate? 😉 Everything is on top of a graham cracker, just so everything is edible. The only problem I had was the flavored tootsie rolls were still soft when I marked the mouth and nose, so they kind of melted in a little bit. But other than that, I think they turned out pretty good.